We want to protect our community from scams by arming you with information to safeguard the number one thing scammers want – YOUR MONEY! These criminals are parading around as trusted individuals to gain access to your bank account and the San Mateo Police Department has seen an increase in these reports. Criminals lie about their identity to steal money from trusting individuals. They can be convincing and use publicly available information against you. Scammers live all around the world. If there’s a phone and/or internet, they can work to steal your money. Caller ID spoofing is real - Don’t trust it! Scammers could even knock on your door, representing themselves as a magazine seller and/or charity. Internet romance scams with fake profiles on dating websites or online games. Bogus door-to-door magazine sellers or charity scammers who collect your personal information, credit card number, or bank account information to misuse it. The “grandparent scam” is where a con artist calls posing as a relative in distress needing money. They usually get details about your life from social media. 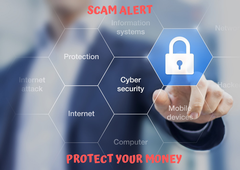 Unsolicited calls from the “Social Security Administration” (SSA) attempting to access your social security number or demanding money to settle a claim. Unsolicited calls from the “Internal Revenue Service” (IRS) ordering you to pay a fine or go to jail immediately. The “arrest warrant scam” poses as a law enforcement officer and warns of impending arrest unless payment is made promptly. You should NEVER deposit money into an unknown person’s bank account. You should NEVER send money to someone you met online. You should NEVER give a stranger your personal information, a credit card number, or a check that has your bank account information on it. You should NEVER give personal information over the phone, unless you initiated the contact and have confirmed who you’re speaking with. Romance scams can feel real; however, the criminal never meets you in person and lies about why they need money. The government will not threaten you with immediate arrest if you don’t pay over the phone. Often, there’s an appeal process for fines levied. The government will never ask you to send gift card numbers or transfer money using digital currency (i.e. iTunes, Green Dot, Bitcoin, etc.). These are normally unsolicited calls, messages, or neighborhood sales and they often sound official. Your private information can be found online. Search your name and see what the crooks can see. Your personal connections on social media can be used against you. Privatize your social media accounts and don’t provide real information on them. What to do if they call or knock on your door? Do not engage the criminal. Immediately hang up and block the phone number. Talk through your door and tell the seller you’re not interested. Call and/or visit the official agency to validate any claim against you. Contact a business directly to purchase a product you want. Who should I report scams to? Federal authorities investigate scams that cross state boundaries. Report scams to the Federal Trade Commission (FTC) and they will share your report with local, state, federal, and foreign law enforcement partners.